These Maple Nut Bars are originally from the Eagle Brand recipe collection. They are comprised of a shortbread crust topped with a layer of nuts and a creamy maple flavored filling. The maple flavor is fairly strong, so anyone who enjoys artificial maple flavored things should be happy. The bars are also very rich, so you may want to cut them into fairly small servings. Also, this recipe desperately needs a new photo! I’ll try to post one soon. Preheat the oven to 350°F. Line a 13×9 inch metal pan with foil and spray foil with cooking spray. Combine the flour, sugar and salt in large bowl or in the bowl of a food processor. Cut in butter with pastry blender or pulse the processor until mixture forms fine crumbs. Stir in 1 beaten egg (or process). Press firmly onto bottom of prepared pan and bake for 25 minutes. Meanwhile, In a large mixing bowl, beat together the condensed milk, remaining egg and maple flavoring; stir in nuts. 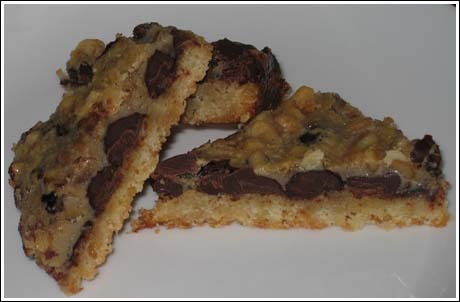 Sprinkle the chocolate chips evenly over prepared crust, then pour the condensed milk/nut mixture over the chips. Return to oven and bake for an additional 25 minutes or until golden. Let cool completely, then lift from the pan and cut into bars. For easier slicing, I recommend chilling the bars before cutting. i am dying to have this recipe; but when i click on Recipe to get it, it comes up with a “Page Not Found”. )-8 Any idea? These are very very sweet and rich. The gooey condensed milk layer is the culprit! I really liked the taste of the crust. If you like super sweet and gooey then these are the bars for you. Oh, and I have no idea who Trixie Belden is, but I read all 132 Nancy Drew books in my elementary school library. My favorite? The Mystery of the 99 Steps. But Ned was a dork. Boy, I wish! But nope. I just talk about products I like. I am really fond of Ghirardelli’s new 60% cocoa chips right now which is why I bring them up. But I’m fickle. Maybe I’ll start hating them next week. Unfortunately, most of my money goes TO Ghirardelli (and Nestle, and Imperial sugar, and King Arthur flour, etc. etc. etc.). I’ve enjoyed reading your blog, and have been meaning to ask: do you receive compensation from Ghirardelli for mentioning their chips? I notice that you often make a point of mentioning them by name, even when you use other recipes such as the bars from Nestles. I was just curious. Thanks for the great cookies. Good luck on your quest for Trixie Belden books. The Gatehouse Mystery was the best, but you should start with The Secret of the Old Mansion. As for maple, I’m not having any problems with the sweetness. Maple syrup always seems kind of mellow to me, not cloying. If you find it too sweet, maybe you could cut it a little with some brown rice syrup? Don’t know. Just thought of that. Congrats on the latest incarnation of your blog–I LOVE the glass of milk image! Clever. Now I am all curious about Trixie Belden, and will check the local library for them. What can I say, I enjoy juvenile literature. Your comment on the fenugreek intrigues me. I also used to love maple sugar candy that my grandmother sent me from NY at Christmas, but now it seems way too sweet for me. I have been using “real” maple syrup on pancakes, but again it is a bit too sweet for my taste, yet I don’t want to go back to “fake” stuff made with corn sweeteners. I wonder if you are having a similar dilemma, trying to get what we think of as “maple” flavor without the intense seweetness. I can confirm that Fenugreek in pill form (the ssupplement) really works as a natural remedy against chest or lung congestion, or coughs. Anyway it’s good to see what you are up to as always. Robin, I’m going to have to go sniff some fenugreek to see if I can discern rotten lawn clippings. Alison, I think I skimmed through a Bobsey Twins book once. Don’t remember much about them, though. I always thought that fenugreek tea tasted like semi-rotted lawn clippings. Not that I’ve ever tried them. I used to love those maple Royals, though. I loved Trixie Belden, too!! And — of course, Nancy Drew….. These bars look great; 1/2 a can of sweetened condensed milk: I have a recipe for shortbread bars [topped w/ creamy filling and ganache topping] that calls for 1/2 can of sweentened condensed milk — I’ve never made because “what the heck am I going to do w/ 1/2 can of sweetened condensed milk”! Now I have an excuse to make….. I was 6 or 7 when my mom bought me my first one, “Secret of the Old Mansion”. We bought it at K-Mart, where they use to have a huge selection of Trixie Belden books. Ha Ha. Not now, I’ll bet. I had a huge crush on Jim. Some screenwriter should come up with a modern Trixie Belden movie. What fun that would be to cast. OMG!!! I LOVED Trixie Belden books when I was growing up! I mentioned them to somebody a few months ago and all I got was a blank stare. I’m convinced – we were separated at birth. Back on topic, these bars look really good. I’m definitely going to break my sweets fast and make a batch. The leftover sweetened condensed milk (while delicious straight out of the can) is really good in coffee.